I’m a native Hoosier who has been a Naples resident for 22 years. I attended Marian University and Indiana University prior to beginning my family and career. I’ve served as a Pre-School Teacher and Director and have been in ministry for the past twenty years. Beginning with Children’s Christian Education Director, I’ve served three major denominations as Director of New Membership and Outreach Ministry, Director of Congregational Care and Director of Pastoral Care. I’ve been a Stephen Minister for 20 years and a Stephen Leader for 17 years, serving as the SWFL Regional Coordinator, a Certified Grief Counselor and as a Naples Community Hospital Chaplain. During these years, I’ve facilitated many support groups including divorce recovery and grief counseling. I’ve served on the Habitat for Humanity Family Selection Committee, volunteered at the Salvation Army Pre-School and am a member of the Red Kettle Committee. Becky has 2 daughters and 6 grandchildren. 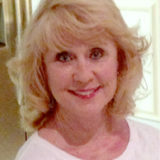 She lives with her husband Gary and her “furry friend”, Trixie and enjoys interior decorating and time with friends. She has been a member of St. John’s Church for the past 3 years and serves as a Lay Reader, Usher and Eucharistic Minister.